Today is the anniversary of the deadliest airship disaster in history, the crash of the U.S.S. Akron on April 4, 1933. The Akron was a flying aircraft carrier designed to provide long-distance scouting in support of fleet operations of the United States Navy. Akron crashed at sea during a storm off the coast of New Jersey in the early morning hours of April 4, 1933, after the ship’s tail hit the water. Despite being a U.S. Navy vessel the ship carried no lifejackets, and only one rubber raft, and most of the crew drowned or died of hypothermia in the freezing water. The Akron disaster was likely the result of poor command decisions relating to weather, navigation, and ship handling. While it is possible that Akron’s tail was driven into the sea by a strong downdraft, it is likely that Captain Frank McCord simply flew his ship into the water. McCord was flying too low for conditions, and he may not have taken his ship’s 785-foot length into account while attempting to climb out of a downdraft; with the nose of the ship raised sharply to climb, the Akron’s tail may have pivoted into the ocean as the result of poor handling. Captain McCord may also have relied on incorrect altitude indications on the ship’s barometric altimeter, which had not been recalibrated to take account of the low pressure in the storm. McCord may have thought his ship was higher than it was, but as an aviator and aircraft commander McCord should have known that an uncorrected barometric altimeter will not display accurate readings after entering an area of low pressure. The crash also killed Rear Admiral William A. Moffett, Chief of the Navy’s Bureau of Aeronautics and a leading figure in America’s rigid airship program. 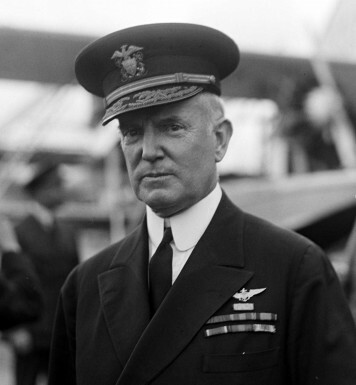 Admiral Moffett and Commander Fred T. Berry (the commanding officer of NAS Lakehurst and its Rigid Airship Training & Experimental Squadron) were aboard the flight as observers and VIP passengers and Captain McCord may have commenced and continued the flight in an attempt to impress them. Both Moffett and Berry were killed in the crash along with McCord himself. Another VIP passenger killed in the crash was Admiral Moffett’s guest, Lt. Col. Alfred F. Masury of the U.S. Army Reserve. Masury was vice president and chief engineer of the Mack Truck company and a fan of rigid airships, having traveled on LZ-127 Graf Zeppelin. Mack is perhaps best remembered for designing the Bulldog hood ornament used on Mack trucks. A complete list of the officers, crew, and guests on Akron’s last flight is available here. U.S.S. Akron’s sister ship, U.S.S. Macon, also crashed at sea on February 12, 1935, under the command of Akron survivor Herbert V. Wiley. The Macon crash ended the American rigid airship program, but after the experience of the Akron disaster her sister ship was equipped with lifejackets and life rafts; of the 76 men aboard Macon’s last flight, only two were lost. As a kid I saw a lot of stored dirigible parts store either on Base(LAKEHURST NAS) or in the town it self, in old Barn type buildings,this would be in the early 60’s. is the hanger still in existence today? love to speak with you. call me anytime. thanks. RIP Akron crew..Admiral Moffett and all of the airship pioneers, those that care about airships/history will never forget you! God Bless! !